Have you hard of “cat circles”? Supposedly, if you make a circle on the ground it will lure unsuspecting cats inside. This might be an internet hoax, but I am not sure. I have decided to conduct an experiment to see if cat circles really work. 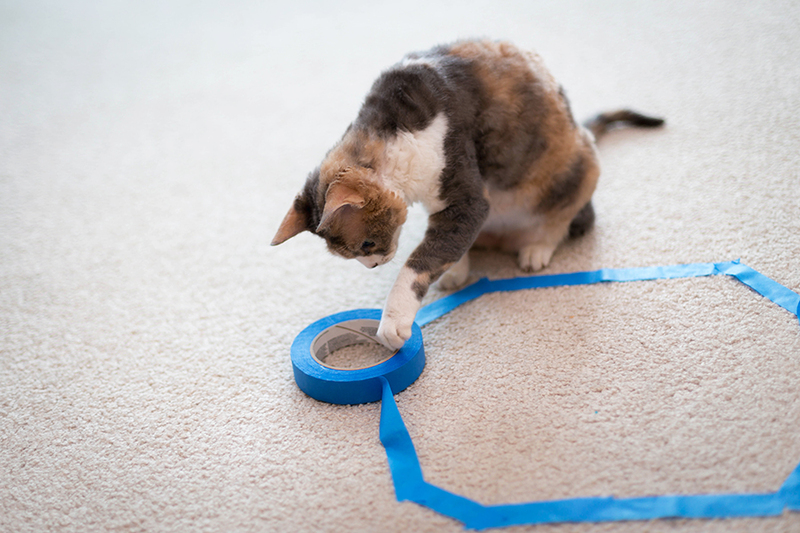 I’m going to use this pretty blue tape and see if I can trap Harley inside a cat circle! Let’s see… it’s a little bit hard to build a circle out of straight lines! I’ll just make this weird sorta-round shape instead. Now to step back and see if it works! WOW! Harley is already strangely drawn to the cat circle, but he seems wary. Let’s see if the trap works! IT WORKED! I have trapped Harley with a simple cat circle. This was a fun experiment! Oh no! I have become trapped in the cat circle, myself, and I can’t get out. Please will someone lend me a helping hand? 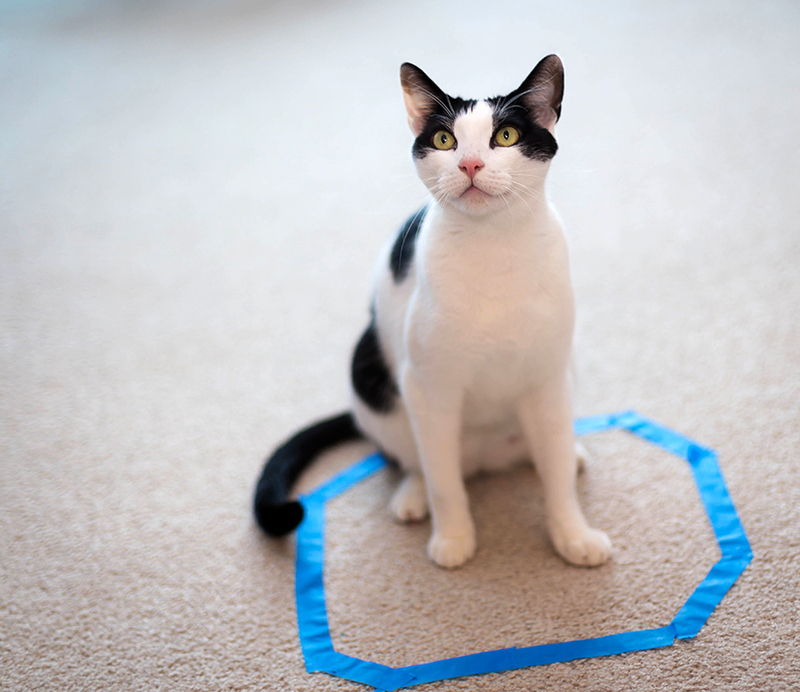 This cat cat circle isn’t very secure. If you’d like a FUN place for your cat or small dog to hang out in, how about this cool Indoor Pet Pen? Sign up here for your chance to win! Update: Congrats to the winner of the Indoor Pet Pen, Lisa Mcfarland! isn’t it funny that this works.. I was very surprised that it actually worked! 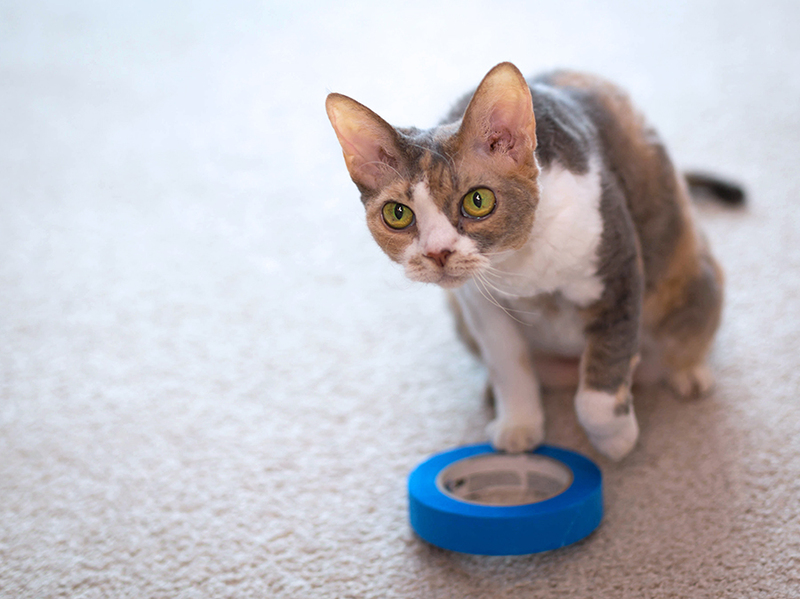 Well if we see Meowm coming with some of that tape stuff we are gonna make a run for it! We don’t want to be trapped! Good job catching Harley though! I’m glad I could warn you before you got trapped! meowloz dai$y & harley !!! whoa….it DOES werk, wunder……. if this same trix werks with fish ? !! It might even work for BURDZ! We tried it here, and it didn’t work! Binga is too crafty. I’d love one of these pens – I’ve seen them at cat shows and thought it would be a nice alternative to my other enclosure. Hugs to you, Harley and Mommeh! I have a feeling Binga is much smarter than the Harleymaniac. Haha! Sometimes I even get trapped by a Kleenex sitting on the counter. Oh noes, I’ve seen some of this tape in my house so I’m going to stay wary of it now! Thank you for the warning Daisy- I would love to trap my own beastie boy brofur Kaspars in one, but I would not like to get trapped like you did. These circle traps seem fun to set up for crazy fur sibs, yet have a sneaky side that will turn on you as well in the end! 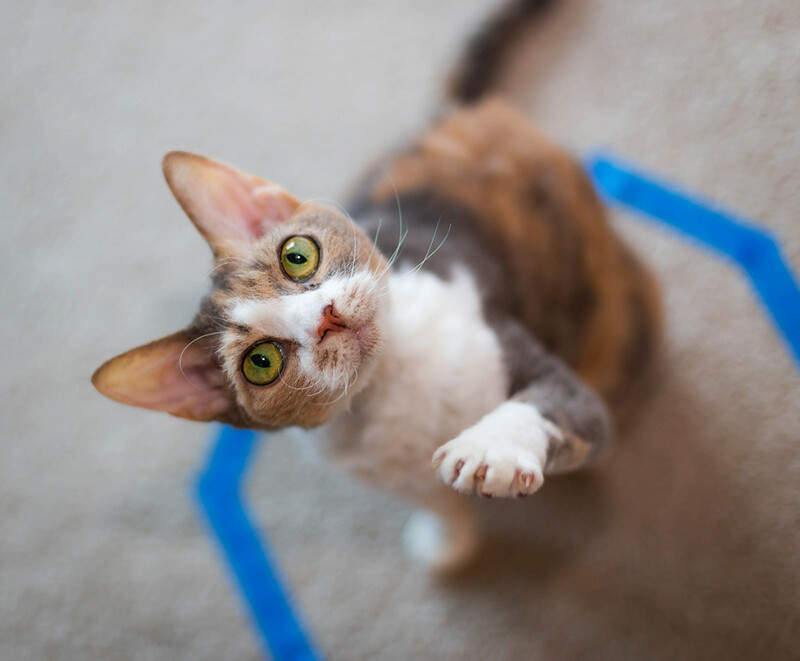 Who knew circles could be so powerful over we felines?! 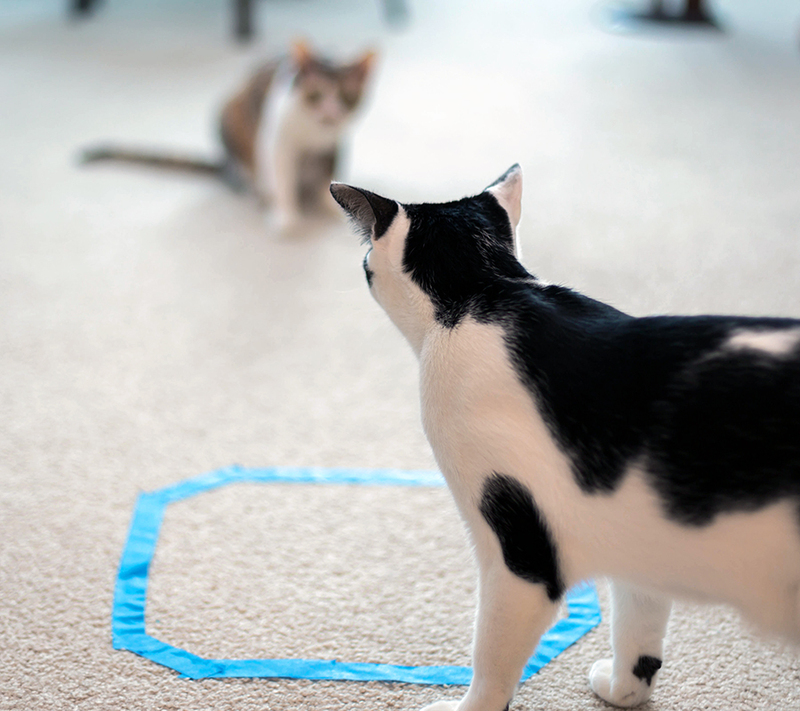 You are so right, those Cat Circles are sneaky!